Superior rodent control that saves you money. 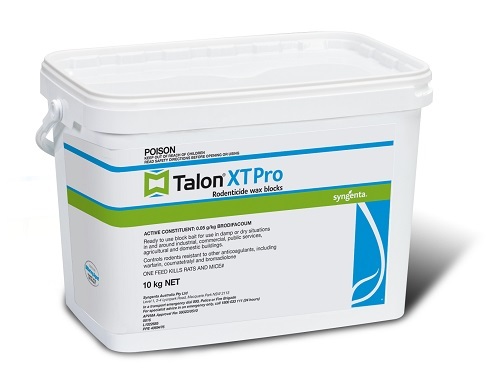 TALON XT PRO is a highly palatable, effective and versatile single feed rodenticide for professionals. TALON XT PRO Rodenticide kills rats and mice in a single feed, making it an exceptional solution for both residential and commercial infestations. Its wax block format also means treating with TALON requires less bait and labour compared to other rodenticides, helping you deliver long-lasting results while saving money. How much TALON is needed for a kill? Rodents only need to consume a small amount of TALON’s active ingredient, brodifacoum, for it to take effect. A lethal dose for mice is about 0.2 g; for rats, it’s about 1.3 g. This amounts to only 5% of their typical daily feed intake. For best results, place baits in stations where rodent activity is noticed and away from children and companion animals. Rodents may feed for up to 3 days, but the first feed is lethal and death will normally occur 4-7 days after bait consumption. In winter rats and mice move indoors.